If you are a foodie and a cook, you probably have a pretty good stash of knives in your workspace. The more experienced the cook, the more knives it seems they have. The experts tell us you need a chef’s knife, a paring knife, and a bread knife and you are all set. If you are a hunter, you also have a special set of knives you use. Most fishing or hunting enthusiasts will probably have a good skinner, breasting, camping kitchen knife, a filet knife and the big gun of knives, a machete. For the less daring who venture a bit closer to home and prefer dry land to water and their back yard to the woods, a good old pocket knife may be something you carry in your pocket. What is one thing all of these folks have in common? The need to keep your knives sharp or their cannot enjoy their hobby. With the handy AnySharp Plus, they can all stay nice and sharp and their knives will too. If you have a knife, the AnySharp Plus can probably sharpen it for you. 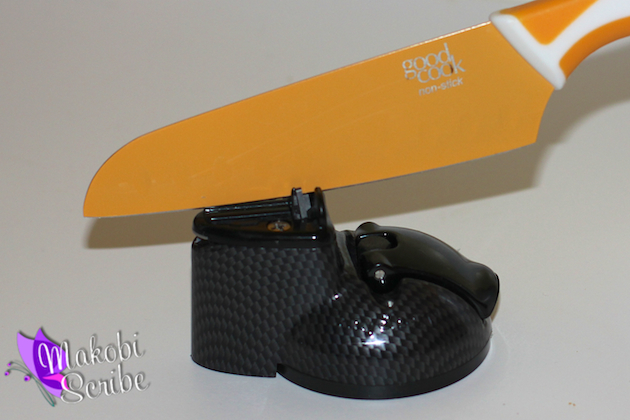 It can sharpen kitchen knives, pocket knives, hunting/fishing knives, gardening tools, hardware tools and scissors. Instead of chucking your sewing scissors or favorite kitchen knife and buying a new one, just sharpen it! Can you imagine how much money you can save each year if you can sharpen instead of replacing those dull blades? The AnySharp Plus can sharpen just about any blade, whether it is a hard anodized or serrated blade. Did you know a sharp knife was actually a safer knife? You are less likely to slip and cut yourself with a sharp blade rather than a dull blade. Also, a sharp blade sure does make your prep time in the kitchen easier and much faster. The AnySharp Pro knife sharpener is the only one of its kind in the world. It has a patented PowerGrip suction cup which can attach to any smooth surface. Once attached, the The AnySharp Pro will not slip, jam and keeps you safer in the kitchen or wherever you are using it. With its tungsten carbide sharpening technology, the AnySharp Pro is easy to use, and when you attache your knife, you can sharpen with just one hand. At the top, you will find a scissor blade sharpener that will not damage your metal edge, protecting your more vulnerable scissors. The AnySharp Pro is small enough to fit in your utility drawer or can discreetly sit on the counter top or other surface. You can purchase your AnySharp Pro, which comes with a 10 year guarantee, from the AnySharp website for $28.00, and for the month of September, enter the code SEP20 at checkout to receive 20% your order at www.AnySharp.com. Previous articleWhat Are Your Favorite Go-To Products In Your Home? Do You Know How To Apply Your Lipstick?